K. Hole, F. Ahmadpour, J. Krishnan, C. Stansfield, J. Copps, C. Nfon (2017). In a laboratory, disinfectants used to inactivate pathogens on contaminated surfaces and to prevent spread of diseases often have adverse side effects on personnel and the environment. It is, therefore, essential to find safer, fast-acting and yet effective disinfectants. The objective of this study was to evaluate an accelerated hydrogen peroxide® (AHP®)-based disinfectant against high consequence foreign animal disease pathogens such as foot-and-mouth disease virus (FMDV) and swine vesicular disease virus (SVDV), as well as Senecavirus A (SVA), which causes similar lesions as FMDV and SVDV. Aims: In a laboratory, disinfectants used to inactivate pathogens on contaminated surfaces and to prevent spread of diseases often have adverse side effects on personnel and the environment. It is, therefore, essential to find safer, fast-acting and yet effective disinfectants. The objective of this study was to evaluate an accelerated hydrogen peroxide® (AHP®)-based disinfectant against high consequence foreign animal disease pathogens such as foot-and-mouth disease virus (FMDV) and swine vesicular disease virus (SVDV), as well as Senecavirus A (SVA), which causes similar lesions as FMDV and SVDV. Methods and Results: We tested varying dilutions and contact times of AHP against FMDV, SVDV and SVA by the standard US EPA and modified methods. AHP was effective against all three viruses, albeit at a higher concentration and double the manufacturer recommended contact time when testing wet films of SVDV. Conclusions: AHP is an effective disinfectant against FMDV, SVDV and SVA. Significance and Impact of the Study AHP-based disinfectant can, therefore, be used in high containment laboratories working with FMDV, SVDV and related pathogens. Foot-and-mouth disease virus (FMDV), swine vesicular disease virus (SVDV) and Senecavirus A (SVA) are small, nonenveloped RNA viruses of the Picornaviridae family (Grubman and Baxt 2004; Hales et al. 2008). FMDV is one of the most contagious animal pathogens infecting both domesticated and wild cloven-hoofed mammals (Grubman and Baxt 2004). In FMD-free countries, an accidental release into the environment can cause an outbreak of disease leading to severe economic loss as was the case in the United Kingdom in 2007 (Cottam et al. 2008). SVDV is stable at pH as low as 2·5 and as high as 12, is more resistant to both heat and disinfectants than FMDV and thus survives for long periods in the environment. Therefore, disinfectants for this virus need to be chosen carefully (Lin and Kitching 2000). A disinfectant capable of inactivating SVDV will most likely also inactivate FMDV. SVA is linked to idiopathic vesicular disease in swine, with lesions similar to FMD (Pasma et al. 2008). Since late 2014, vesicular disease linked to SVA has been observed in grower-finisher pigs and breeding herds in the United States and Brazil (Leme et al. 2015; Joshi et al. 2016). SVA has also been detected in mice, houseflies and environmental samples at both affected and unaffected premises (Joshi et al. 2016). However, much is still unknown about the spread, survival in the environment and disinfection conditions for SVA. In FMD-free countries, only high containment laboratories are allowed to work with FMDV and related viruses. Proper disinfection is, therefore, crucial in these laboratories and is routinely used to decontaminate work surfaces, animal cubicles, biosafety cabinets and equipment. The chemical disinfectants used in these laboratories are chosen depending on the locations, efficacy against the target pathogens, and the safety and speed at which they act. Most of these disinfectants are harsh not only to the people and the environment but also on the equipment and work spaces (Cogliano et al. 2005; Omidbakhsh and Sattar 2006; Kim et al. 2013; Rutala and Weber 2016). As such, it is vital to manage and minimize the risks involved with using these chemicals. Harada et al. (2015) recently evaluated 13 commercially available products for their speed and effectiveness as disinfectant against FMDV. Acidic ethanol, alkaline cleaners and sodium hypochlorite were effective, causing >3·0 log reduction in virus titres (Harada et al. 2015). An accelerated hydrogen peroxide® (AHP®)-based disinfectant has also been tested as a broad-spectrum disinfectant against bacteria, fungi and viruses (Omidbakhsh and Sattar 2006). This chemical was virucidal against select human and animal viruses including bovine viral diarrhoea virus and feline calicivirus. Notably, virucidal effect was observed against poliovirus type 1 (Sabin), same family (Picornaviridae) as FMDV, SVDV and SVA (Omidbakhsh and Sattar 2006), suggesting potential effectiveness of AHP against these viruses. However, direct testing against each target virus is advisable before any conclusions can be made and the disinfectant adopted for use in a high containment laboratory. The objective of this study, therefore, was to evaluate the effectiveness of an AHP-based solution as a safe, fast-acting disinfectant for a laboratory working with FMDV, SVDV and SVA. Cells and viruses: All viruses used for testing were propagated in a foetal porcine kidney cell line constitutively expressing αvβ6 integrin (LFBKαvβ6 cells: Larocco et al. 2013; Fukai et al. 2015; Larocco et al. 2015) kindly provided by Animal Research Services, Plum Island Animal Disease Center. Viruses tested were SVDV (UK27/72), FMDV serotype O (O UKG 11/2001) and SVA (SVA/Canada/ON/FMA-2015-0024). Virus production :Briefly, 10 T150 flasks of LFBKαVβ6 cells were infected at a multiplicity of infection (MOI) of 0·1 with either SVDV or FMDV. Flasks were incubated at 37°C, 5% CO2 and 95% humidity, monitored until 100% cytopathic effect (CPE) was observed (approximately 18 h), frozen at −70°C for a minimum of 1 h and thawed quickly to release the virus from the cells. Cell debris was pelleted with an initial centrifugation step of 10 000 g for 30 min at 4°C. Supernatant was collected and centrifuged in an ultracentrifuge at 96 000 g for 2 h 30 min with a sucrose cushion to further concentrate the virus. Viral pellets were resuspended in DMEM containing 5% nonirradiated FBS (as organic matter) and stored at −70°C. For SVA, a T75 flask of LFBKαVβ6 cells was infected at an MOI of 0·1. As above, the flask was incubated and monitored until full CPE was reached, frozen at −70°C, thawed quickly and the supernatant was clarified by centrifugation. The titre for SVA was 9·3 log10 TCID50 per ml, and therefore, there was no requirement for further concentrating the virus. Final titres for FMDV and SVDV were 7·3 log10 TCID50 per ml and 9·05 log10 TCID50 per ml, respectively. Prior to use in experiments, SVDV was diluted 1 : 10 in DMEM (containing 5% FBS), SVA was diluted 1 : 50, and FMDV was not diluted. Disinfectants and neutralizer: AHP in concentrate form (Prevail® concentrate; Virox® Technologies Inc., Oakville, ON, Canada) was tested along with Virkon® (Vetoquinol, Lavaltrie, QC, Canada). A 1/40 dilution of 7% v/v solution of Prevail concentrate is the manufacturer recommended working concentration of the disinfectant. Working dilutions of either 1/20 or 1/40 (AHP) or 1% solution (Virkon) were made in Milli-Q water. To neutralize both AHP and Virkon, sterilized Letheen broth containing 0·1% sodium thiosulphate was used (Omidbakhsh and Sattar 2006). Testing of disinfectants: The experiment was performed as previously described by Omidbakhsh and Sattar (2006) and according to US EPA (2012) Antimicrobial Division recommendations, with minor modifications. Briefly, 200 μl of SVDV, FMDV or SVA (diluted in media containing 5% FBS as organic matter) was spread as uniform thin films on duplicate sterile 100 × 15 mm glass Petri dishes. Films were either dried at ambient temperature for approximately 1 h (SVDV only) or treated as wet films (SVDV, FMDV and SVA), followed by the addition of 2 ml of diluted AHP with a designated contact time. Initially, AHP was tested at 1/40 dilution with a contact time of 5 min. Due to results obtained, testing was repeated at a dilution of 1/20 with 5- and 10-min contact times on wet films for all three viruses. Virkon (2 ml, 1% solution and 10-min contact time) was used as a positive disinfectant control. For virus recovery (no disinfectant) control, films were treated with 2 ml of media only. AHP, Virkon and all controls were neutralized with 4 ml of the Letheen broth containing 0·1% sodium thiosulphate. In addition, for evaluation of cytotoxicity due to chemicals in disinfectants and neutralizer, 200 μl of media (without virus) was treated as described above. The contents of each Petri dish were recovered after gentle scraping to dislodge any adherent material. Serial 10-fold dilutions (up to five dilutions) of the recovered suspensions were prepared in appropriate media and used to inoculate 90% confluent monolayers of LFBKαvβ6 cells in 96-well plates (four replicates for each dilution); cell control wells were included. All plates were incubated at 37°C for 1 h for virus adsorption, inoculum removed, monolayers washed with PBS and replenished with fresh culture media (DMEM containing 2% nonirradiated FBS). The plates were further incubated at 37°C, 5% CO2 and 95% humidity for 2–3 days and the monolayers examined for CPE. If CPE was not observed in any wells, a second passage was performed by transferring the contents of the first plate into corresponding wells of 90% confluent monolayers of LFBKαvβ6 cells in fresh 96-well plates. The cytotoxicity control wells were examined for any cell death due to the presence of residual toxicity from the chemicals used. Neutralizer effectiveness control test was performed by treatment of the virus film with a neutralized AHP (at 1/20 dilution) solution (a 1 : 2 solution of diluted AHP and the neutralizer, where the two solutions were mixed together prior to dispensing onto the viral film, total of 6 ml of this solution dispensed and incubated for 5 min at room temperature). Neutralizer effectiveness control test was similarly performed for 1% Virkon with 10-min room temperature incubation to match the contact time required for disinfection. To determine the long-term stability of the working solution of AHP (1/20 dilution), experiments were completed as described above using wet films of FMDV and SVDV. A 1/20 dilution of AHP was prepared, immediately tested and the remaining preparation stored at room temperature in a closed glass bottle and tested every 2 weeks over a 6-week period. Results were tabulated and the TCID50 for virus recovery controls and test samples calculated according to the Reed and Muench (1938) method. The effectiveness of AHP as a disinfectant was determined by the reduction in virus titre in the test samples relative to the virus recovery control. Results were considered acceptable if the cell controls were viable, uncontaminated and no cytotoxicity was observed beyond the first 10-fold (10−1) dilution. Cytotoxicity of disinfectant: Neither 1% Virkon nor neutralizer alone was toxic to LFBKαvβ6 cells. AHP (at 1/40 and 1/20 dilutions) was toxic to LFBKαvβ6 cells at the 10−1 dilution, completely obliterating the cell monolayer. Subsequent dilutions (10−2 to 10−5) were nontoxic to the cells (data not shown). Neutralizer effectiveness: The mean of virus titres recovered from the disinfectant/neutralizer mixture from three independent tests was 5·7 log10 TCID50 per ml (standard deviation (SD) 0·2) for AHP and 6·4 log10 TCID50 per ml (SD 0·2) for Virkon (Table S1). The mean of the titres for the virus recovery control was 6·4 log10 TCID50 per ml (SD 0·1). Thus, there were no significant differences in virus titres recovered from the disinfectant/neutralizer mixture compared with the virus recovery control. The neutralizer was, therefore, considered effective for neutralizing the 1/20 dilution of AHP and 1% Virkon. Virucidal effect of AHP against SVDV by the standard test method: The standard method for testing disinfectant according to the US EPA includes allowing the virus film to dry prior to the addition of disinfectant (Omidbakhsh and Sattar 2006). SVDV was the only virus tested as a dry film with the suggested 1/40 dilution of AHP and a 5-min contact time. The virus recovery relative to the calculated input titre was decreased due to the drying of the films (Krug et al. 2011). Virus recovery titres are shown in Table 1. Complete virucidal effect was observed at dilutions of AHP/neutralizer mixture beyond the 10−1 dilution. The cytotoxicity observed at 10−1 dilution at first passage was absent upon second passage on LFBKαvβ6 cells and no CPE was observed (Table S2). These data indicate a >4-log reduction in virus titre (>3-log past the point of cytotoxicity). Therefore, AHP (at 1/40 dilution and 5-min contact time) was effective against SVDV by the standard test method of using dry virus films. Table 1. Virucidal effect of accelerated hydrogen peroxide on foot-and-mouth disease virus, swine vesicular disease virus and Senecavirus A Virus Film type AHP dilution Contact time (minutes) AHP/virus/neutralizer titre (log10 TCID50 per ml) Virus recovery titre (log10 TCID50 per ml) SVDV, swine vesicular disease virus; FMDV, foot-and-mouth disease virus; SVA, Senecavirus A.
FMDV and SVDV were both tested as wet films using a 1/40 dilution of AHP and a contact time of 5 min. AHP (at 1/40) was effective against FMDV resulting in >5-log reduction in virus titre as evidenced by the complete absence of CPE after two passages of virus/AHP/neutralizer mixture on LFBKαvβ6 cells (Table 1 and Table S3). On the contrary, for SVDV, CPE was observed in sporadic wells of LFBKαvβ6 cells after two passages of virus/AHP/neutralizer mixture indicating incomplete virucidal effect of AHP at 1/40 dilution for SVDV wet smears (Table S4). According to the USEPA, when cytotoxicity is present, CPE should not be present at any other dilution in the test in the 3-log range beyond the dilution causing cytotoxicity (US EPA 2012). Thus, 1/40 dilution of AHP was ineffective as a disinfectant for wet films of SVDV. 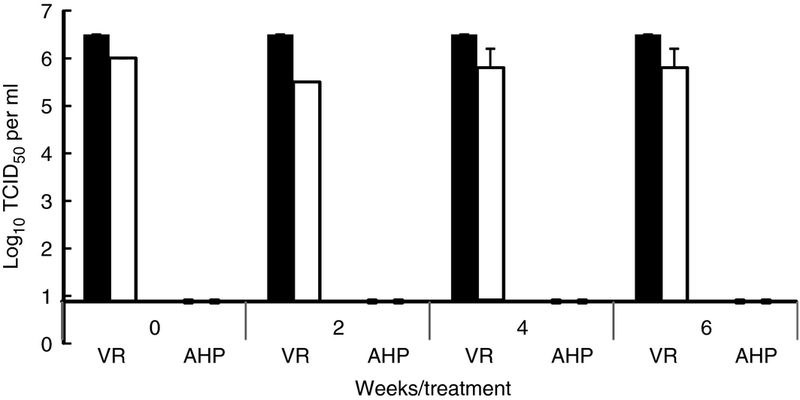 Consequently, the virucidal effect of AHP against SVDV was retested using a higher concentration of the disinfectant (1/20 dilution) and contact times of 5 and 10 min. With a 5-min contact time, CPE was again observed in sporadic wells of LFBKαvβ6 cells upon second passage, indicating incomplete virucidal effect of AHP at 1/20 dilution and 5-min contact time (data not shown). However, with the contact time increased to 10 min, no CPE was observed on second passage when AHP was used at 1/20 dilution on wet films of SVDV (Table 1 and Table S5), resulting in a >5-log reduction in virus titre relative to the virus recovery control. Similarly, AHP at 1/20 dilution and 10-min contact time resulted in a >4-log reduction in virus titre for SVA (Table 1 and Table S6), meaning the disinfectant was effective against wet films of SVA. In all the tests, 1% Virkon at 10-min contact time was effective against SVDV, FMDV and SVA as a positive disinfectant control (data not shown). Long-term stability testing: When AHP (at 1/20 dilution) was reconstituted, tested immediately after preparation and every 2 weeks thereafter at a contact time of 10 min, the disinfectant retained its effectiveness against wet films of FMDV and SVDV 6 weeks following initial preparation (Fig. 1). This working stock of disinfectant was, therefore, stable for at least 6 weeks when stored in a sealed bottle at room temperature. Virucidal effect and stability of accelerated hydrogen peroxide (AHP) over time. AHP was reconstituted at 1/20 dilution, tested immediately after preparation and every 2 weeks thereafter for virucidal activity against foot-and-mouth disease virus (image, FMDV) and swine vesicular disease virus (image, SVDV) at a contact time of 10 min. This working stock was stored in a sealed bottle at room temperature. VR = virus recovery control, AHP = virus treated with AHP disinfectant. Error bars represent standard deviation (n = 3 tests). Disinfectants are designed to kill or inactivate targeted pathogens and therefore aid in stopping the propagation and transmission of pathogens. However, many chemical disinfectants can also be harmful to humans, other animals and the environment (Cogliano et al. 2005; Omidbakhsh and Sattar 2006; Kim et al. 2013; Rutala and Weber 2016). The need for less harmful yet effective disinfectants has, thus, become increasingly critical. For a chemical to be classified as an effective disinfectant, it must completely inactivate the treated virus in a standard test. If cytotoxicity is present, there must be complete virucidal effect and a minimum of 3-log reduction in virus titres beyond the cytotoxicity level (US EPA 2012). In this study, we have demonstrated the virucidal efficacy of AHP against FMDV, SVDV and SVA. At the recommended dilution, AHP effected a complete virucidal effect and >3-log reduction in SVDV titres beyond the cytotoxicity level by the standard method of testing using dry films of virus. This is in agreement with previous reports on the virucidal effect of AHP against multiple viruses including poliovirus type 1 (Omidbakhsh and Sattar 2006). Conversely, when the recommended dilution of 1/40 and contact time of 5 min was used on wet films of SVDV, virucidal activity of AHP was incomplete. This could be due to the higher titre of virus in the wet smear as evidenced by the virus recovery titre. In the standard method, desiccation of the virus film reduces the virus recovery by 1–2 logs (Krug et al. 2011), implying the disinfectant acts on a lower amount of virus in the standard method as opposed to the modified approach of using a wet film. Also the sporadic appearance of CPE in the incompletely disinfected SVDV treatments could be attributed to very low titres of the infectious virus being present in the mixture but not evenly distributed, therefore making it possible for a set of wells in one dilution to be negative, while the subsequent dilution receives virus and thus results in CPE. However, at double the recommended concentration (i.e. 1/20 dilution) and double the contact time (10 min), virucidal efficacy of AHP against wet films of SVDV, as well as FMDV and SVA, was ensured. To the best of our knowledge, this is the first report on a laboratory demonstration of an effective disinfectant for SVA. However, our results for FMDV differ from a previous report of failure to inactivate this virus in skimmed milk using 0·1–0·3% hydrogen peroxide (Sonder et al. 1990). However, at a higher concentration (3%), hydrogen peroxide inactivated more than 99–99·9% FMDV after 4–5 h incubation but the remaining 1–1000 TCID50 per ml of residual infectious virus still posed a risk of transmission (Sonder et al. 1990). The differences could be explained by the potentially high organic matter content in skimmed milk and the fact that the mixture was incubated at 5°C. Furthermore, AHP contains safe and biodegradable stabilizers and surfactants that act in synergy with hydrogen peroxide to increase its efficacy (Omidbakhsh and Sattar 2006). The test on wet films was performed to mimic a laboratory setting whereby, because of time constraints, biosafety cabinets and work surfaces are not necessarily allowed to dry prior to being sprayed with disinfectant. Considering that AHP has been shown to be nontoxic, nonirritating to skin and eyes and nonsensitizing, this disinfectant is a viable option for routine disinfection in high containment laboratories working with FMDV and SVDV. Furthermore, the active ingredient in AHP (H2O2) breaks down to water and oxygen and leaves no active residue, rendering it safe for the environment, plants and aquatic life (Omidbakhsh and Sattar 2006). Chemical decontamination is also required when moving items from biocontainment level 3 or 4 to a lower level of containment. Dunk tanks made of stainless steel are often filled with chemical disinfectant for this purpose. The chemicals currently used in our laboratory are only effective for a week and are corrosive and PPE is required when preparing them. Our results with SVDV and FMDV show a long-term stability of AHP, over a period of 6 weeks when stored in a sealed bottle. This suggests that AHP could be a cost-effective and ideal disinfectant for dunk tanks, but similar long-term stability studies are needed using an actual dunk tank. In conclusion, AHP (Prevail concentrate) used at the manufacturer recommended dilution of 1/40 is an effective disinfectant against SVDV when tested by the standard method. However, at 1/40 dilution, for laboratory practical purposes, it could be ineffective at completely disinfecting wet surfaces contaminated with SVDV. Nevertheless, at 1/20 dilution and 10-min contact time, AHP has complete virucidal effect on wet films of SVDV, FMDV and SVA. Therefore, for laboratory, it is recommended to use AHP at a 1/20 dilution with a contact time of at least 10 min. Furthermore, AHP at 1/20 dilution stored in a sealed container is stable at room temperature for at least 6 weeks. Acknowledgements: Funding for this study was provided, in part, by the Virox Technologies Inc., Oakville, ON, Canada and, in part, by the Canadian Food Inspection Agency. Conflict of Interest: We recognize that Virox Technologies Inc. is the manufacturer of Prevail concentrate, contributed funding to this project and could benefit from the data in this report. However, this did not influence the conclusions in this study, and this report is not an endorsement of the product.